This is my first Turkish twist knife. It is on my Gamemaster pattern which is an excellent heavy use field knife. This particular one has 4 bars in it of left and right hand twist. There is a large amount of steel loss with this pattern. I lose about 50% of the steel to the grinding belt and forge to achieve this pattern. 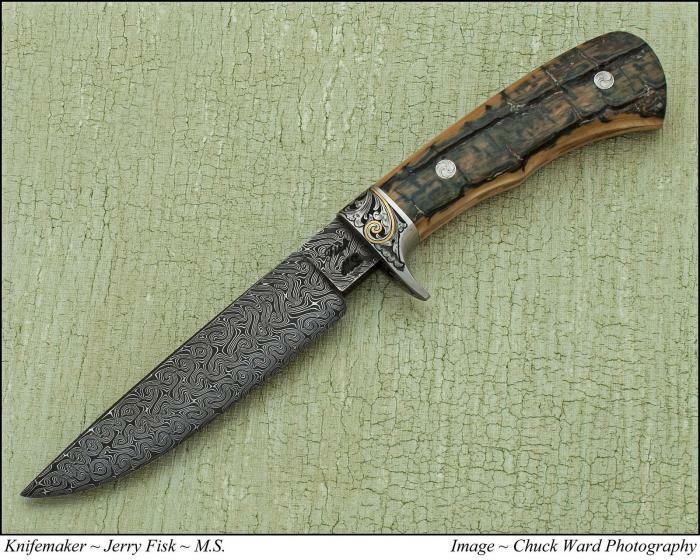 For that reason there will be a limited amount of Turkish twist of any pattern of knife that I do. Simply put, the welding time is more than double, there was enough steel to have made this hunter to have made a 10 inch Damascus bowie. It is as classic and old World as you can get. This knife will cut well if you want to use it or you can make your friends sit up and take notice of your hobby of collecting knives. This is a one of a kind NLT marked piece. I made a wider than normal stainless guard for it so I can do some deep relief engraving with some gold inlay. I chose an outstanding piece of fossil mammoth that has been setting in my shop for 5 years now. The off side has a lot of blue color running through it. Updated photos as I progress with it.